SKU: 8907043188516 Stock: Not Available Category: Rosewood Products. 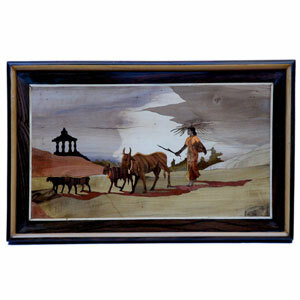 R/W LS Wall Panel-Cattle With Lady.Karnataka Handicrafts is one of the reliable providers of a varied range of wooden products like Rosewood Divan. These are crafted from hand-chosen rosewood. These are mainly used in household applications or official purposes. Developed using advanced technology, they have longer applicability and are known for their termite-free nature. These wooden products are offered at competitive prices.